HOME OFFICE DESK 110x70cm. Desk with folding legs with white top shelf and grommet hole. Collapsible desk with upper shelf. Steel anti-corrosion painted frame and high density polyethylene surface. The surface has a hole with a desk grommet to pass connection cables through. 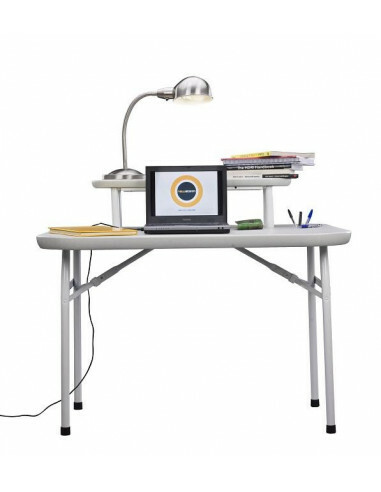 The desk grommet can be used as a base for desk lamps. There is a second hole in the desk surface for the connection cables to pass through, or to insert the pencil-holder that is included.